In today’s digital world, contact details of most of our acquaintances, friends, family members, colleagues etc are stored and maintained in either our cell phones, computers or laptops. But imagine a scenario where our systems hard drive crashes or our mobile is stolen or our cell phones battery drains out right at the moment when you need to contact someone urgently. 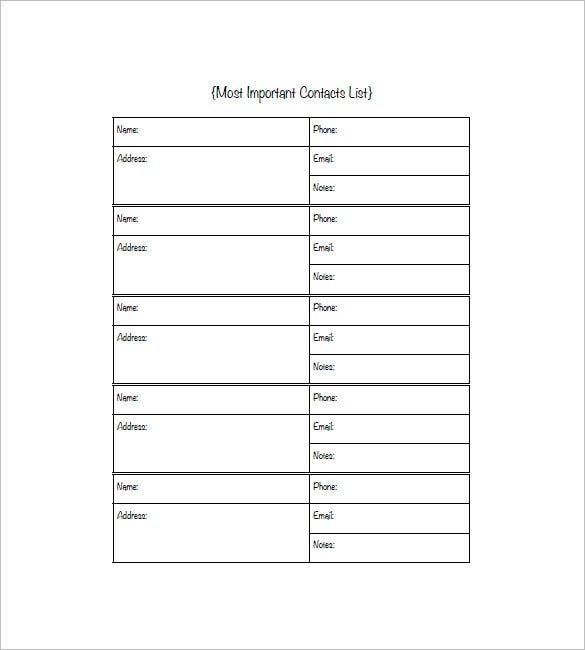 You may also see To Do List Template. This is where manual copy of contact details play a vital role. It is always advisable to maintain data in soft copy as well as hard copy for backup. 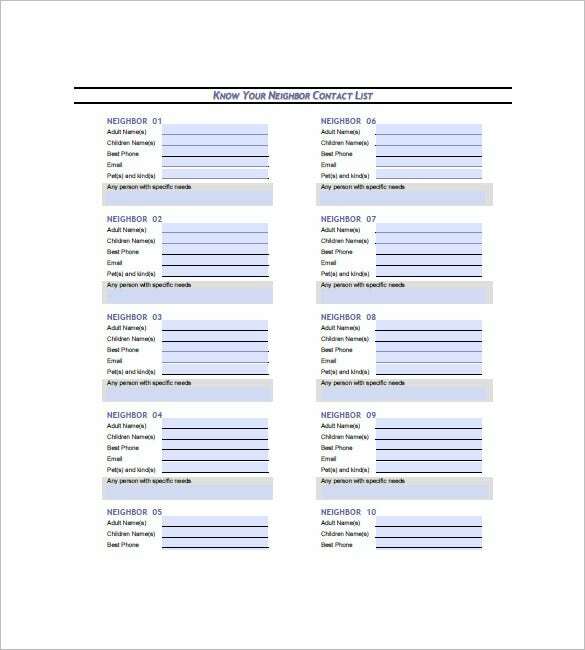 Available here are a variety of list templates which are easy to download edit and print as per users requirement. 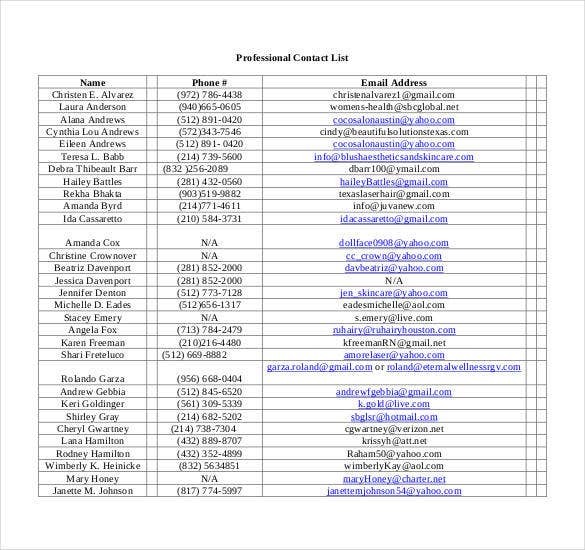 home-storage-solutions-101.com This template is the simplest contact list to maintain, it’s called the most important contact list. 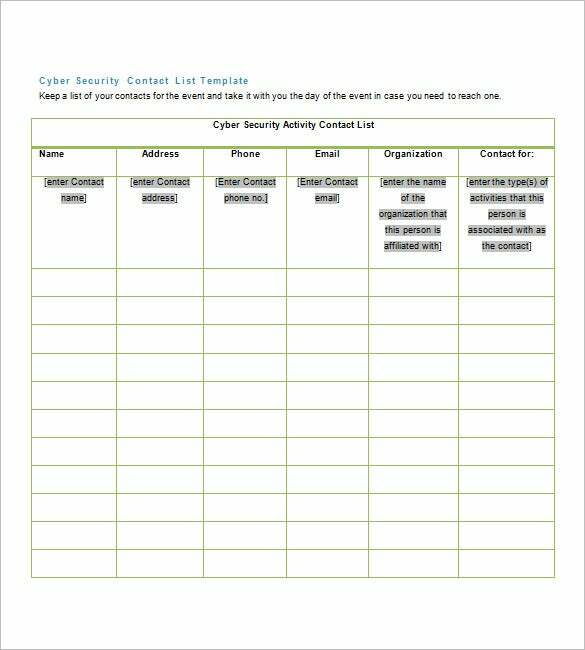 This template helps to maintain data like name, address, phone number, email id and special notes if any of all your important contacts be it personal or professional. gamehavenbsa.org This template is used to maintain contacts details which can be used in case of emergency. It includes information about the person like his name, address and contact number, contact information about nearest relatives, contact numbers of family, work place and personal cell phone number, details about name and contact of children’s school / day care provider and medical number of hospital and family physician. 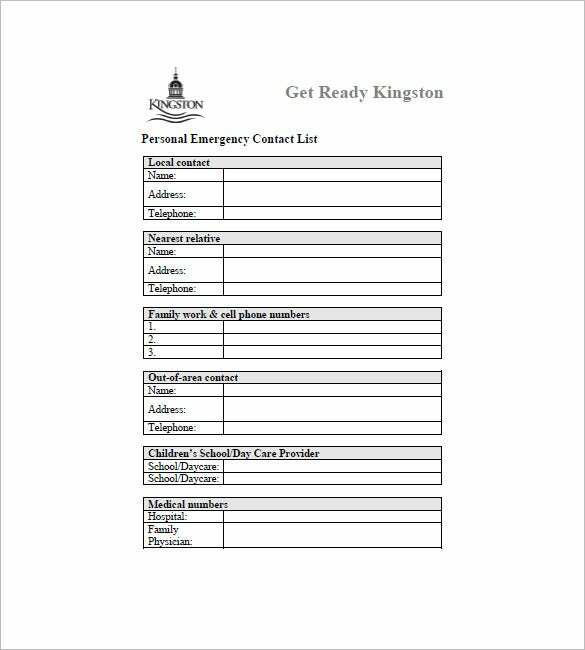 This template is very useful and a must to carry during travels to get assistance in case of an emergency. scedd.us This is a very useful template for organization to maintain systematic information about their employees. 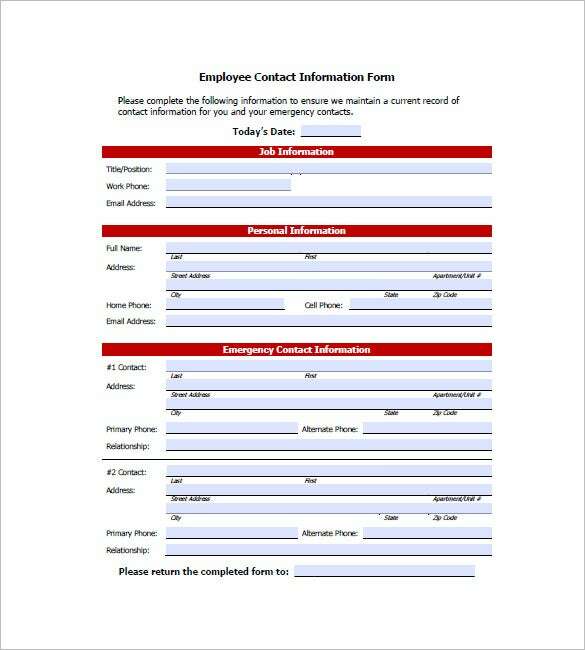 It includes information like personal details of employee such as full name, address, home contact number, cell phone number, personal email address, job related information like job title, work phone number, official email id, and emergency contact information like name and address of the person to contact in case of emergency and their relationship with the employee. 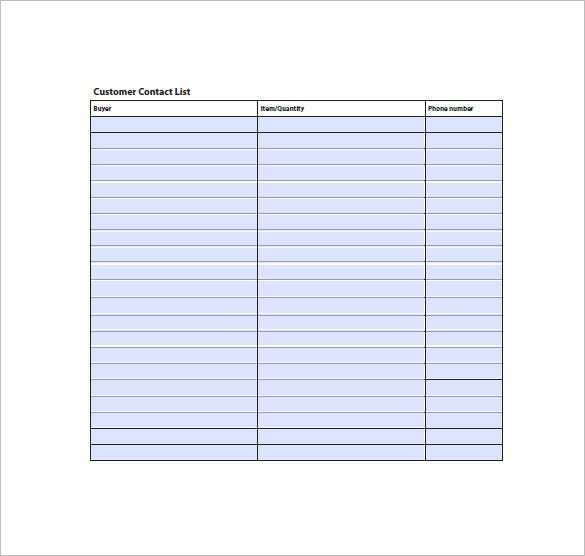 extension.missouri.edu This template is useful for retail outlets and stores it includes information like buyers name, item bought, quantity bought and their contact details. It data can be used for future reference if the outlet plans to announce a new product or scheme or special discounts. How do you get your Contacts List from your Google Account? 1. Go to google contacts from your signed account. 2. Check the contacts you wish to import. 3. Click on ‘More’ and then ‘Export’. 4. You can back up your contact either in Google CSV or any of the Free Contact List Templates. 5. Save your file in desire format. How can I get my Contacts List Back from Gmail? Don’t panic if you accidently deleted, changed or merged contacts in Google account, you can still have option to get it back. If you have made any changes in your Gmail contact list in last 30 days, you can undo the changes and retrieve the contacts. Here is how: Login to Gmail Account and go to Google Contacts. First export your current contacts, so that you can add them up after restoring the old ones. Click on ‘More’ and then ‘Undo Changes’. Click on confirm and after that you can save it in your Contact List Template. 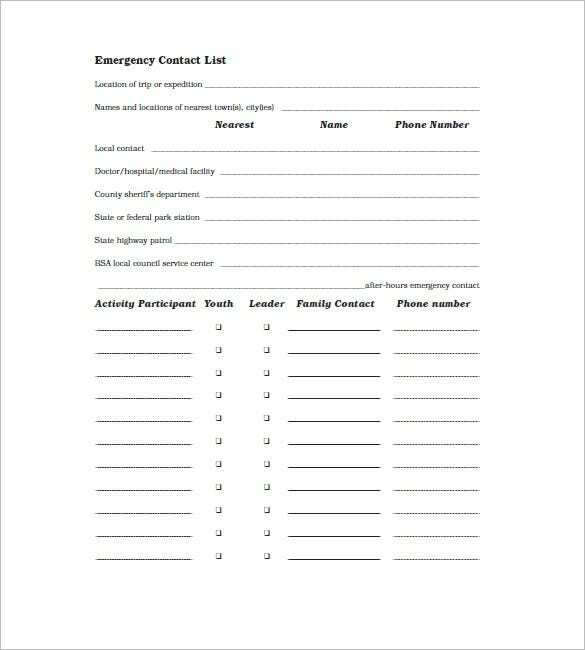 What Numbers Should be on an Emergency Contact List? Proffered phone numbers that include parents, relative and close friends. Email address of the office personals in order to update at the earliest. Doctor and healthcare professional contact information. Emergency phone numbers of Ambulance, Doctors, Police, Fire department, and so forth. Click ‘Address Book’ on Homepage. On the File menu click on new entry and select ‘New contact group’ under entry type. Put your entries in the contact list and save it. Click OK and your distribution list in available in contact folders. You can easily keep track of your all type of contacts with this elegant templates. You can maintain your customer contact list, client contact list, emergency contact list, favorites contact list and customize your category as per your requirement. The templates can easily be imported or exported in your Gmail or Google account. You can print these templates and can easily convert into the requisite format. You can share these contact list across various platform and also send text or emails to multiple contacts at a time. You can explore more lists like Birthday Gift List Templates, Holiday To-Do List Templates, and Free Contact List Templates to have a quick access and reminder on your important events. 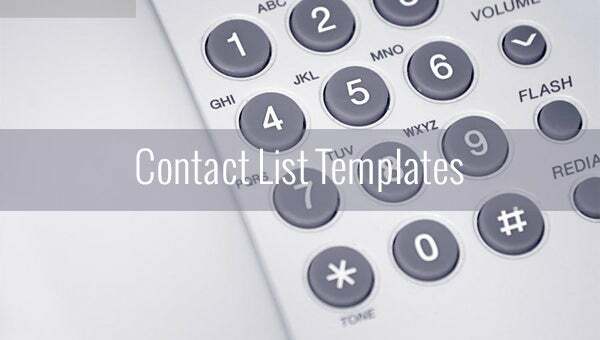 A Contact List template is a ready guide to all your contact information without being dependent on gadgets. 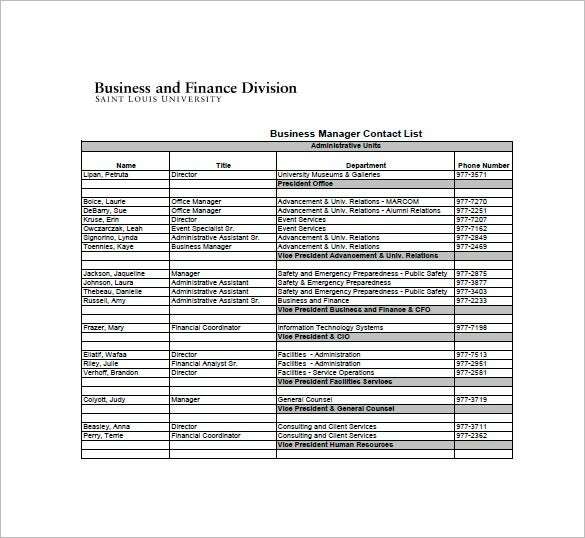 Maintaining a contact list a step towards management of contact data in an organized manner. It’s an essential tool to manage all your contact details be it personal or professional in a systematic manner and create our own data bank of contact information. Also when the data involved is in larger numbers using a template is the easier and less time consuming. We humans are termed as social animal and hence staying connected to people is an essential aspect of our life. 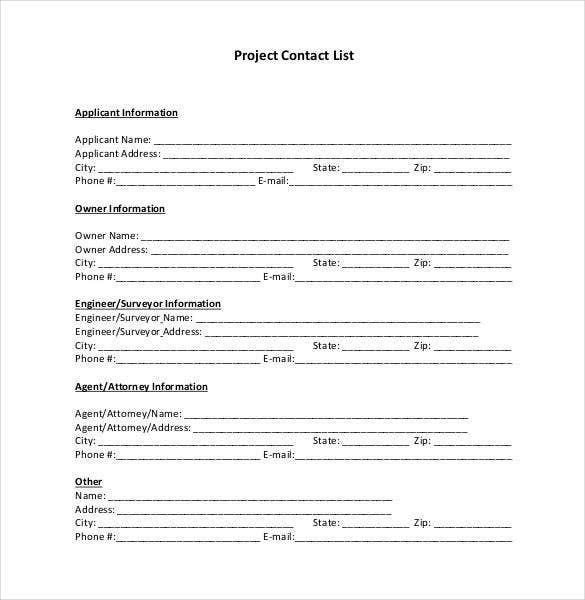 Be it for personal reasons or professional the most important thing to enable us to connect with people is have their contact information, hence go head and download a Sample Contract Template from the many options available with us and STAY CONNECTED!!!. If you have any DMCA issues on this post, please contact us!